Definitely one of my favorite entries. Great work, man. Solid game play. The concept is easy to understand and follow. The only thing missing is music. Thanks for playing! What os are you running it on? I only ask because there should be music and sound effects (even an evil boss laugh). I wonder if maybe they don't play on certain version of windows? windows 7. Sound FXs play but no music. Oh man, it's a full blown ninja turtle RPG... It's like broke geek Christmas! lol thank you! I'll have to look into the errors when dying...I wasn't able to duplicate them. Every time I die I just go back to character select. I really liked the characters and the animations! 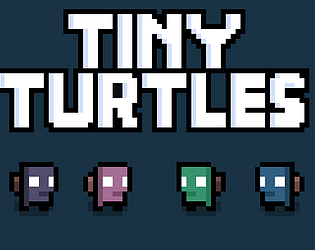 I know the main characters are turtles, but I think they need to be a bit faster for this kind of game to work. It's hard to dodge and evade when the enemies walk straight towards you faster than you can move. The character looks like the one in hopfrog's forager. The walking animation is very cute! I think the room should be a little smaller. Sometimes I had to search for the last enemy. That being said, that also might be a problem with the restricted resolution. But overall it was fun! Thank you! Yeah I had a hard time balancing room size with the number of enemies in each. I think I should have went with more rooms that were smaller and had fewer enemies. Thanks for playing! Nice game and nice art, I can see you follow Heartbeast.